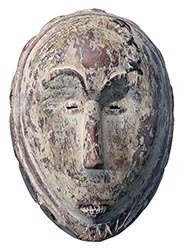 Masks like these light masks represented the spirit of an ancestor and were used for social control by Ngil, the judiciary association. The facial markings, abstract features and strong. 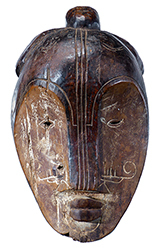 elegant lines are typical of Fang masks, which were among the most influential on 20th C. modern art. 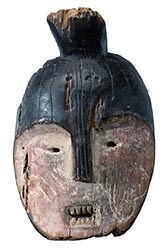 The masks with raffia are wired to hang on a wall, but would look even more impressive mounted on stands. The measurements on the individual pages are for the mask and the mask plus raffia.